Sofia Fernandes has performed in many places around the world including Portugal, Angola and Canada. Her musical education began at a young age. Growing up in Lisbon, Portugal, she started by learning the violin at the age of seven with Catarina Frias. Later she started studying classical guitar with portuguese guitarist Pedro Ferreira. The city of Lisbon had a vibrant arts scene, which gave Sofia an opportunity to grow musically. Upon moving to Canada, she started studying with classical and flamenco guitarist Mark Harry. 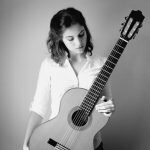 Sofia’s past experiences as a guitar performer and teacher in Portugal and Canada have lead her to pursue higher musical education as a classical guitar student at the University of Toronto, where she completed her Bachelor of Music degree with renowned Canadian guitarist Rob MacDonald. During Sofia’s music career she has attended and participated in many masterclasses by renowned guitarists around the world, including David Russell, Ricardo Gallén, Berta Rojas, Solo Duo, Carlo Marchione, Pavel Steidl and many others. With each of these masterclasses have come valuable lessons and experiences. Central to Sofia’s beliefs and goals as a musician is to be honest and have a positive attitude towards music. She believes that attitude plays a big role in one’s performance. Sofia has participated in music festivals in Portugal, Spain and Canada and has been a first place award winner at the North York Music Festival and the Peel Music Festival in Ontario.